(SMNE, Press Release) — Putting humanity before ethnicity or other differences and caring about the freedom of others—for no one is free until all are free— could have created a different ending for each of the tragic stories affecting Ethiopians that have unfolded in the last weeks. These incidents did not have to happen, but in each case, could have been avoided or lessened in severity. Much of the pain, suffering, death and loss of countless people and their loved ones could have been avoided had those involved simply put these God-given principles into practice. Each incident has an overwhelming component of tribalism gone wrong. How unjust is it to kill, rob and steal from another collective group, dehumanizing them as the othersimply because of their ethnicity or the way they look? How wrong is it to commit crimes without any compassion because the other(s) are not part of your own group? How immoral is it to take revenge against some random person, who has done nothing but be of the same ethnicity as the person inflicting harm to some within your own collective group? Recurring and avoidable tragedies result when the worst of tribalism is carried out against the collective other; whether on a small-scale, institutionalized into systems like Ethnic Federalism of the TPLF/EPRDFor mixed together and exploited, usually for the benefit of the dominant partner. Unfortunately, the consequences of these tragedies are now serious and far-reaching. To further complicate matters, they must be dealt with in an environment entirely lacking the supports for success. Collective punishment flourishes in environments where there is a failure of justice. It shows a weak rule of law that is ineffective in ensuring protection for the innocent from collective attacks and hindering those impacted from taking collective revenge. One person can kill another without any consequences. Ethnic federalism of the TPLF/EPRDF and its policies that capitalize on ethnic differences or other distinctions actually promotes this. When a ruling party of the TPLF/EPRDF uses ethnicity, religion, political viewpoint, activism, region or other factors to divide people, to protect self-interest, to play favorites with opportunity, to repress legitimate rights and to cover-up needs or complaints rather than dealing with the real problems; the results are what we have recently seen in exploding ethnic-based violence, hunger, and death encountered by the thousands fleeing the country. Gambella has become the site of increasing ethnic-based violence and killing. On April 21, 2016, two Nuer girls, refugees from South Sudan who were living in the Jewi refugee camp in Gambella, Ethiopia, were hit and killed by a car driven by a highlanderassociated with a humanitarian group, Action Against Hunger (ACF). The term Highlanderrefers to a lighter-skinned person originally from the highlands of Ethiopia, rather than indigenous to the region). In response, some Nuer refugees sought retaliation for their deaths by killing ten or more highlanders, who lived or worked in Gambella. None of those killed were driving the car involved in the accident. The only thing they had in common was their skin-color. Now, highlanders have organized and are retaliating against innocent Nuer, killing three persons. Of the three already killed; none are refugees, but instead are Ethiopian citizens who had nothing to do with the murder of the highlanders. The highlanders also carried out a protest followed by the attempt by some of them to go to the refugee camp and Nuer areas, but regional and federal security forces prevented them from doing so. Some highlanders threw rocks at the vehicle of the governor of the region, a Nuer, and broke the windshield. Protestors shouted that they did not want to be led by a refugee, claiming the current governor was a refugee from South Sudan rather than a citizen of Ethiopia. Protestors also attacked the vehicle belonging to Riek Machar, the Vice President designate for South Sudan and leader of the SPLA-In Opposition, himself a Nuer, who was preparing to return to Juba to assume his new position there. He condemned the killings by all groups, including the Nuer. In another incident, occurring a week ago, many were shocked to hear the heart-breaking news of the murder of over 200 Nuer, local citizens of Gambella, who were attacked by approximately 300 armed Murle tribesman who are said to have crossed the Ethiopian border from South Sudan to carry out a simultaneous attack on thirteen Nuer villages in the early morning hours of April 15, 2016. 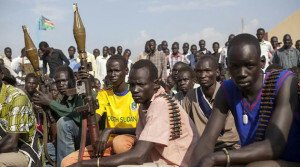 During that attack, mostly unarmed Nuer desperately fought to protect their families against the heavily armed Murle. In addition to the killings, over a hundred children and some women were abducted and two thousand head of livestock taken. It is said that the Murle then returned to South Sudan. These Nuer were not involved in the later attack on the highlanders this past week. What happened to the Nuer impacted other Ethiopians as can be seen from the many messages of sympathy and support in the social media. Public sentiment was strong; not only because of the great loss of life and the abduction of the women and children, but also because these were foreign aggressors, entering across Ethiopia’s porous borders to attack a vulnerable people who were unable to defend themselves due to the lack of security forces and their disarmament. We in the Solidarity Movement for a New Ethiopia (SMNE)express our deepest sympathy to those who lost their loved ones and pray that the wounded will soon recover and that those who have been abducted will quickly be returned to their homes and families. These are egregious crimes, piercing the hearts of many caring people; not only within the Nuer community, but far beyond. Sadly, the numbers of tragic reports affecting the people of Ethiopia and in the Horn of Africa have become almost a weekly occurrence. It overwhelms our emotions. It is almost too much to emotionally deal with when we think of these tragedies being followed by two separate incidents where approximately 500 people from Ethiopia, Eritrea and Somalia were drowned crossing the Mediterranean in overcrowded ships in search of freedom and opportunity. This means 1,000 people— men, women and children. The stories from survivors who watched their loved ones drown, unable to save them, are appalling. We also grieve for these precious lives and extend our heartfelt condolences to the families of those who so tragically drowned. According to reports, the majority of people who lost their lives, in both incidents, were Oromo, many of them young people escaping the recent violence and government-sponsored killing in Ethiopia. We have heard that some of these victims were activists in the peaceful demonstrations against the regime’s plan to take over indigenous Oromo land as part of the Addis Ababa Master Plan. Fearing arrest, torture or deadly repercussions, they fled Ethiopia, never expecting to lose their lives on the way. We deeply feel the pain of these lost lives. These young people were committed to building a better future within the country; but for some, it became too difficult, if not impossible, to do so. Those lost in the sea were also victims of human traffickers who exploited the desperation of those fleeing their countries; however, most of these victims may never have left the country except for the government-sponsored killing of peaceful protestors— over 600 since last November. Added to the tragedy of these events is the worsening starvation among Ethiopians, especially impacting the people of the Afar and Somali regions of the country. Unfortunately, the peace, security and one-mindedness necessary to better deal with such a deepening food crisis are missing. On the other hand, the TPLF/EPRDF government appears to be more proactive in their response to the case involving the Nuer killed by the Murle, possibly because the aggressors came from outside the country. We hope a strategy can be developed to bring the perpetrators to justice, to return those abducted as well as the cattle; however, it is also important to understand how it happened in the first place so it is not repeated. According to reports coming out of Gambella, the deaths could have been avoided. The Murle alleged to have committed the killings, came from another country. Had there been more security at the borders to protect the citizens; they could have been stopped at the border by Ethiopian security forces whose job it was to protect the borders. However, they were not present to do their job, leaving the border open without any supervision. Up until recently, there had been indigenous security forces at the border, consisting of members of the local ethnic communities. However, in February, ethnic violence had erupted between the Nuer and Anuak. These security forces, whose job it was to protect the people of Gambella without bias; instead, turned on each other. We can blame the TPLF/EPRDF regime, known for using ethnic apartheid divide and conquer politics to maintain tight control over the region, as well as throughout the country. We can also point to years of regional political decisions that were used as tools to alienate one group from another; but yet, the bottom line is that members of both the Nuer and Anuak communities fell into their trap and became complicit in carrying out acts of violence against the other. This is at a time when reconciliation among the people is of utmost importance. Instead, the situation went out of control without anything to stop it. Rather than dealing with the conflict and crimes committed by various players; the indigenous security forces, as a whole, were disarmed and moved from the border, leaving the country and people vulnerable to attacks such as this one. This provided an open door to groups like the Murle who had committed nearly the same acts against three Anuak villages several weeks ago. At that time, sixteen people were killed, including children and women, and eight children were abducted. Three Anuak villages were burned down.Following this incident, the TPLF/EPRDF regime took no action, essentially giving the opportunity for it to be repeated. This is now the second time. Had the authorities responded as they should have done the first time; it is unlikely that this most recent incident would have been repeated. Following the latest incident where 200 Nuer were killed, Ethiopian Prime Minister Hailemariam Desalegn made a public statement; but what the country needs is more than a statement. It will require action. If the regime really cares for the Ethiopian people, someone should be held accountable for this. One of those in such a position of responsibility is the Defense Minister who should explain why there was such a lack of security when the risk of guns, violence and further killing was so strong. What is the purpose of defense forces and the legal system when they are not put into action? Again, its a failure of the rule of law. People agree that a tragedy has happened to the Nuer, but the response of the TPLF/EPRDF should be in a mature, responsible way that will not lead to losing more lives. Reportedly, Ethiopian troops have been given permission by President Salva Kiir to enter South Sudan to find the perpetrators; but it is imperative that an outcome would include a plan to address the security issues. Simply pursuing the Murle as a whole, instead of the actual perpetrators may be used as a shortcut, but it presents the risk of worsening the outcome, especially if innocent Murle are targeted rather than bringing the real criminals to justice. A meaningful and sustainable solution should be found where the responsibility of the government to protect its own citizens is carried out in actuality, not just in a superficial way in order to look good to outsiders. Concern for the safety of the borders should encompass all our borders since it is not only a problem in Gambella, but also in other places, like the border of Kenya. If the government is not willing to secure these borders; they should arm the citizens so they can protect themselves from exactly these kinds of attacks in the future. These crises in the country signal an opportunity for the TPLF/EPRDF to act for the good of the people; changing their focus from self-preservation and self-interest to acting as a government for the people. In doing so, it may be the best opportunity to help avert a larger crisis that could lead to greater instability. This may be the right time for the TPLF/EPRDF to come to their senses to change the course both they and Ethiopians are on that could lead to an escalation of widespread ethnic violence— a place none of us want to go. Instead, it is a chance to bring lasting change that could save everybody— including them. An example of such change would be to open up political space instead of repressing and cracking down on citizens, which includes opening up the media and the exchange of information via technology. Another example would be to release opposition leaders and political prisoners from prisons and jails, and to start a genuine dialogue with the opposition within the country. Still another example would be to revoke the anti-terrorism law used to repress free speech and political activism and also the Charities and Societies Proclamation that has decimated civil society. The TPLF/EPRDF should listen to the demands of the people. At such a time as this, people are losing hope and these crises that are rising up from every corner of the country will only make it worse, as will the increasing starvation. When people warn about ethnic-based violence exploding, these reported incidents are signs of what could happen on a larger scale without change. Already many Ethiopians— as well as the ruling regime— see themselves first as a collective group where their own survival is seen as primary. The result is the dangerous dehumanization of others that could easily explode under existing conditions. This shows how vitally important it is to embrace a worldview that puts humanity before ethnicity or other differences and protects the rights and freedom of others so that one’s own freedom and rights are upheld; both for practical reasons as well as moral reasons. The forces of change are already crouching at our door. Those forces could push us towards positive change or result in negative actions leading to an escalation of the consequences we have been seeing. Would it not be better to realize change will come, one way or another, and to embrace the opportunity to bring it in the right way? May God help Ethiopians come to their senses so as to avoid the collision course we are on now. In closing, we are heartbroken by what has been happening and believe we can find a genuine solution if we are willing to embrace values that support not only our own collective group, but all our people— putting humanity before ethnicity, or any other difference. Human life is precious and as a society, when these lives are lost, we grieve together regardless of ethnicity, religion, regional background, political view or any other differences. Until we are all free, no one will be free and secure. These principles, upheld by individuals, communities and the rule of law, could have stopped all of these tragedies from occurring and could even minimize the effects of the famine. With God’s help, they could equip Ethiopia for a future beyond what we could ask or imagine. May God strengthen the families of those who have lost loved ones as they go through this difficult time and may He lead us from the edge of danger to a more compassionate, just and free Ethiopia for all. 20 Ethiopian Political and Civic organizations write to WHO board of directors in opposition to the candidacy of Tedros Adhanom to the post of Director General of the World Health Organization (WHO). We are a diverse group of Ethiopian Diaspora organizations from all parts of the world, working in the field of human rights. We write in opposition to the candidacy of Tedros Adhanom, Ph.D. for the post of Director General of the World Health Organization (WHO) and respectfully urge you to reject his candidacy. Dr. Adhanom’s nomination as the sole candidate representing Africa is not only an insult to Ethiopia but to all Africans. His candidature must be read in the context of the political, social and economic policies of the government of Ethiopia that he represents. He has served as the Minister of Health from 2005 – 2012 and currently serves as the Foreign Minister for the government of Ethiopia. One need only to scan the various reports from international organizations to gain an understanding of the human rights tragedies ever present in Ethiopia as a direct result of the policies of the Ethiopian government. Dr. Adhanom is a member of the inner circle of a ruling party whose leadership style is antithetical to democracy and respect for the rule of law. Lack of free elections in more than two decades, a fact that has been documented by numerous organizations and governments, serves as prima facie evidence of a repressive regime. As the face of that government, Dr. Adhanom did not lend confidence as a public health figure while he served as the Minster of Health in Ethiopia. As outlined in this letter, his tenure as head of the Federal Ministry of Health was fraught with mismanagement, incompetence and in particular to the monies granted from the Global Fund to Fight AIDS Tuberculosis and Malaria, resulted in an audit by the Office of the Inspector General. Therefore, it is hard to imagine a scenario in which an individual with such a compromised resume would be a candidate worthy of serious consideration for the immensely respected and extremely consequential position of the Director General of the WHO. 1- Despite laboratory identification of V cholerae as the cause of the acute watery diarrhea (AWD), the Government of Ethiopia decided not to declare a “cholera outbreak” for fear of economic repercussions resulting from trade embargos and decreased tourism. 2- The government, in disregard of International Health Regulations, continually refused to declare a cholera epidemic and largely declined international assistance. As a signatory to this agreement, the Government of Ethiopia had the obligation to report the outbreak because cholera is not endemic to the country. Second, without official declaration of a cholera outbreak, there was a delay in accessing donor funds. Declaration of a cholera outbreak might have resulted in a much more vigorous international response, and resources might have been mobilized much more rapidly. Also, refusing to acknowledge a cholera epidemic weakens the chances for ongoing surveillance to recognize the potential for cholera endemicity in the region. 4- The United Nations Office for the Coordination of Humanitarian Affairs reported unacceptably high case fatality rates (in 3 of the 5 affected Oromia zones (Guji, East Shewa, and Bale). It is an incontrovertible fact that the Ministry of Health under the under the stewardship of Dr. Tedros Adhanom deliberately failed to contain the crisis and was directly responsible for the death of thousands of Ethiopian citizens. His action smacks not only of gross incompetence but outright criminality. It defies common sense that such a compromised individual responsible for the tragic and unnecessary loss of so many lives in one country should even be considered as a viable candidate to run the World Health Organization. While Dr. Adhanom served as the head of the Federal Ministry of Health, his office was a recipient of funds from the Global Fund to Fight AIDS Tuberculosis and Malaria. In 2010, the Office of Inspector General (OIG), a body commissioned to audit and investigate Countries receiving Funds from the Global Fund to Fight AIDS, TB and Malaria (GFATM), conducted an audit of Ethiopia. It is important to note that audits and investigations are performed when a specific risk is identified in countries GFATM programs operate and/or due to a unanimous or open whistle blowing. In Ethiopia, both were found to be the reason which prompted the investigation into the funds (USD 1,306,035,989) allocated to Ethiopia. 2) Substandard quality of constructed health facilities by diverting funds which were budgeted for other activities including procuring drugs for patients and prevention activities. 5) Inadequacies in internal audit and lack of organizational independence 6) Principal Recipient (PR) Governance. The OIG concluded that “the Global Fund grants have been successful in increasing coverage for the three diseases. At the time of audit, there was weak implementation of PMTCT reflected in poor performance against grant targets. A total of USD 165,393,027 was spent on Health Centre construction, resulting in over expenditure of USD57,851, 941 or 54% against the approved budget for health facility renovation. There was inadequate control in place to assure quality and effective use of the constructed health facilities. From the audit findings, the OIG could not provide assurance that oversight arrangements ensured that grant funds are used for the purpose intended. It was the recommendation of the OIG that the Ethiopian government should refund USD 7,026,929 to the Global Fund. As a politburo member of the Tigray People’s Liberation Front (TPLF) that has been ruling Ethiopia for the last 24 years Dr. Adhanom is closely associated with a regime well known for its systemic patterns of political repression and egregious human rights violations against Ethiopian citizens. The abysmal human rights record of the Ethiopian government is very well documented by all the major international rights groups (Human Rights Watch, Amnesty International and Freedom House) including in the U.S. State Department annual human rights report. In considering Dr. Adhanom’s candidacy for Director General, we implore you to take the following factors into account regarding the human rights situation in Ethiopia. the recent mass killings of over 400 Oromo civilians some as young as 8 years old. the draconian Charities and Societies Proclamation and Anti-Terrorism laws specifically created to stifle dissent. the widespread attacks on freedom of expression and information, including censorship, control of news and information, and the closure of newspapers. the prominent political leaders who are victims of harsh imprisonment and torture with their members continually harassed and intimidated by government security forces. the Ethiopian Muslim community and religious leaders who have been unjustly incarcerated under the Anti-Terrorism Law for demanding that the Ethiopian government stops interfering in their religious affairs. Dr. Adhanom’s election to lead WHO will effectively put a seal of approval on the gross and systematic abuses of the repressive regime in Ethiopia. It will allow the regime to claim a victory that Dr. Adhanom’s selection to lead a prestigious organization such as WHO is evidence of its respect for human rights and compliance with international standards and further embolden it to continue its shameful behavior towards its own people. Dr. Adhanom’s record as a member of the ruling party in Ethiopia and specifically his record as Minister of Health does not meet the exceedingly high standards required for a Director General of the WHO. While we would be excited and proud to have a candidate representing Africa, we believe it would behoove us to promote a candidate whose track record doesn’t include policies which led to a deadly Cholera outbreak in 2008 and are leading to an impending famine in 2016. It is inconceivable that failure at improving the health outcomes of one country and mismanagement of funds obtained from an organization such as the GFATM should result in one’s candidature for the leading health organization of the world. Consequently because of the aforementioned reasons, we respectfully urge you to reject Dr. Adhanom’s candidacy for the post in the 2017 election. Representatives of the coalition are available to meet with you or your staff should you have any questions regarding the concerns we have expressed regarding the candidacy of Dr. Tedros Adhanom. We appreciate your consideration regarding this very important issue. እንግዲህ ያቺን ሴት ይቅናት ነው የምል፡፡ እርግጥ ነው ለ2 ወይ ለ4 ዓመታት በብዙ መስዋዕትነት የምታጠራቅመው ገንዘብ ምን ሊሠራ እንደሚችል መገመት አይከብድም – ዛሬ ቆጠራው በሚሊዮንና በቢሊዮን ሆኗል፡፡ በመቶ ሺዎች ቢኖርህ ምናልባት እስኪያልቅ ድረስ ብብትህን ወትፈህ ትጠጣበት ወይ ትበላበት እንደሆነ እንጂ ዘዴኛ ካልሆንክ ብዙም አይፈይድልህም – ገንዘቡን ዜሮ አድርገውታል፡፡ ኢትዮጵያ ውስጥ አሁን የወረደው እሳት ቀላል አይደለም፡፡ የብሩ ዋጋ እጅግ በመጋሸቡ በፌስታል ሙሉ ብር የምትገዛው ነገር በጣም ጥቂት ነው – ያሳቅቅሃል፤ ባልና ሚስቶችማ የጊዜው ዋና የጠባቸው መነሻ ይሄው የአጋንንት ውላጅ የሆነው ገንዘብ መሆን አለበት፡፡ የኃይሌ አንድ ብር የመንጌን አሥር ብር ቢያህል የወያኔን ደግሞ በአማካይ 500 ብር ይሆናል – ልታስበው ትችላለሀ፡- በብር አንድ ሺህ ይሠራ የነበረ አንድ መኖሪያ ቤት በተመሳሳይ አሠራር አሁን በትንሹ 600 ሺህ ብር ከፈጀ ግሽበቱ ስንት ዕጥፍ ነው? ሒሳብ ካላወቅህ ሰው ጠይቅና ተረዳ፡፡ የደርግ ጊዜው የስሙኒ ለስላሳ መጠጥ አሁን ከአሥር ብር በላይ ነው፡፡… ታዲያ ሰው ሁሉ ጠጪ የሆነው ወዶ መሰለህ? ባለው ገንዘብ ብርጭቆ ውስጥ ከመደበቅ በስተቀር የተሻለ ቁም ነገር ሊሠራበት አልቻለም፡፡ ስለሆነም በተስፋ መቁረጥ ስሜት ቀደም ብዬ እንደጠቆምኩት አዳሜ ጆሮውን ወትፎ እስከውድቅትና ከዚያም ባለፈ ያገኘውን መጠጥ ሲቆጋ ያድራል፡፡ ንጹሕ ጉበት ይዞ መሞት ዱሮ ቀረ ወንድሜ! ሀብታሞችና ኢንቬስተሮች ሆይ! ገንዘባችሁ ሰው ይሁን – ትልቁ ገንዘብ ሰው ነው፤ ሰውን ማዕከል ያላደረገ ገንዘብም ሆነ ሌላ ነገር ከንቱ ነው፡፡ የገንዘባችሁ ምንጭ በመጠኑ የእናንተ “ታታሪነት”ና ወሳኝ አመራር ሊሆን ቢችልም በዋናነት ግን በሥራችሁ ቀጥራችሁ የምታሠሩት ወገናችሁ ነው፡፡ እሱን አክብሩት፤ ውደዱትም፡፡ ያ ሠራተኛ ባይኖር ብቻችሁን የትም አትደርሱም ነበር፡፡ ያን ሠራተኛ ስትወዱትና ስታፈቅሩት ታስቡለታላችሁ፡፡ እንደሰው ቁጠሩት እንጂ እንደመገልገያ መሣሪያ አትቁጠሩት፡፡ በፈጣሪም ዘንድ ያሳጣችኋል፤ ያስወቅሳችኋልም፡፡ እውነት ለመናገር ለውሻቸው የሚጨነቁትን ያህል፣ ለውሻቸው የሚበጅቱትን በጀት ያህል ለሠራተኛቸው የማይጨነቁና በቅጡ የማይከፍሉ ሀብታሞች ሞልተዋል፡፡ “ሰው ቢሄድ ሰው ይተካል” የሚባለው ፈሊጥ ለመሣሪያ እንጂ አንተን አንቀባርሮ ለሚያኖር ሰብኣዊ ፍጡር ሊሆን አይገባም፡፡ ሀብታሞች ሆይ! የማሰብ አቅማችሁን ተጠቀሙ፡፡ ዛሬውኑ ሰው ሁኑ፤ ሰው ለመሆን ደግሞ ከአሁኑ መሞከር እንጂ በግድ በእርጅና ዘመን የሚቋቋምን የበጎ አድራጎት ድርጅት መጠበቅ አይገባም፡፡ ቀጥራችሁ የምታሠሩት ሰው እንደናንተ መኖር ያምረዋል፤ እንደናንተ መልበስ፣ እንደናንተ ባማረ ቤት ውስጥ መኖር፣ እንደናንተ መብላትና መጠጣት፣ እንደናንተ ገንዘብ በባንክ ማኖር፣ እንደናንተ መዝናናት፣ እንደናንተ … መሆን ያሰኘዋል – እንናንተው ሰው ነውና፡፡ ታዲያ ለምን ከናንተ አሳንሳችሁ እንደተንቀሳቃሽ ንብረታችሁም ቆጥራችሁ ታዩታላችሁ? እንኳን እሱ የሚለፋ የሚደክመው እናንተስ በጥቂት ድካም ባፈራችሁት ሀብት እንደዴቪስ ቲቶ ሰማይን እስከመጎብኘት ትዝናኑ የለምን?